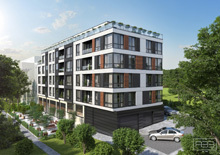 "Buy in Bulgaria" offers a newly built apartment complex, situated in the picturesque seaside resort of Alen Mak, Varna. The building was built in 2008 and has Act 16. It consists of 20 apartments. Construction is brick and concrete, with internal and external insulation and PVC joinery. The constructor has installed wiring for telephone, TV, internet and intercom system. Common areas are fully furnished and the yard is landscaped. There are two apartments offered for sale, with areas of 49 and 53m2, they both consist of an entrance hall, living room with kitchenette, a bedroom, a bathroom and balcony. The apartments have stunning sea and mountain views. Every apartment has its own basement and ground floor parking space in the courtyard of the building which is included in the price. Note: The apartment can be finished by the buuilder at extra cost! "Alen Mak" is a seaside resort located in a quiet area of the city, close to Golden Sands resort. Has a 3 km long beach. The region is suitable for living, has easy access to the city and regular bus services. Shops, restaurants and hotels can be found nearby.